I happened to run across someone’s New Year’s Resolutions on Pinterest recently, laid out with one per month, twelve resolutions in all. This sounds really doable to me, having a single goal per month—and I’m all about finding a way to accomplish resolutions! Maybe by the end of the year the best will have stuck. I hereby announce my 12 Vintage Resolutions for 2014, and believe me, these actually all do have to do with vintage clothing and accessories. January: Edit out and recycle everything that is not being worn in my closet. 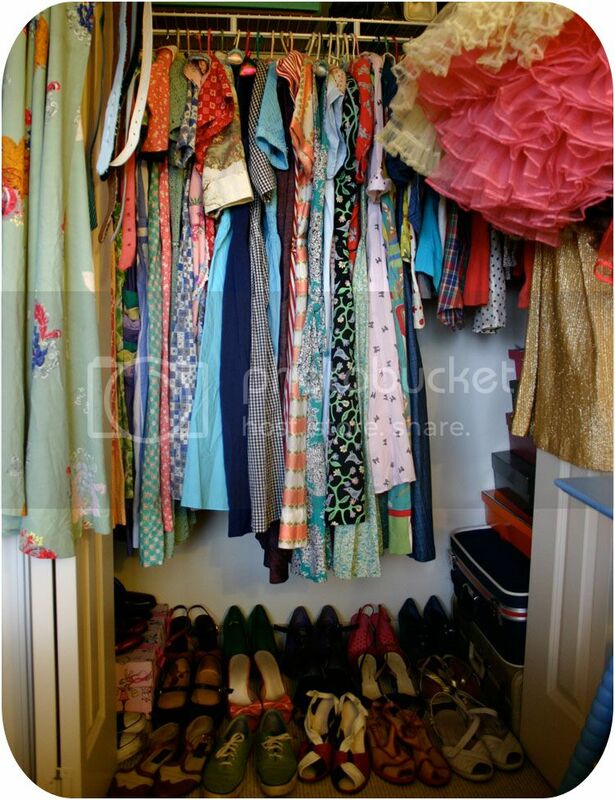 My closet is smaller than this one, and certainly not as neat. I would like to make it as happy, bright, inviting and wearable as I possibly can. How does this have to do with vintage? I will be making room for the great vintage items that I don’t feel I can squeeze in right now! February: Dress like a star at home. No, I don’t mean to start sitting around sipping champagne, dripping in diamonds! I mean always treating myself well, even at unseen moments, by dressing in something that makes me feel happy. As a vintage clothing dealer I have sold many an item that would certainly qualify, and these items tend to tug at me...I feel slightly jealous of the people who purchase them. I actually feel spiritually unhappy when I dress down, so why not carry this into every moment of my life? March: Wear a color I don’t usually wear. Yes, I am fairly aware of the colors that work well on me and make good use of those as often as I can. I do think, though, that I could see what happens with some colors that I am not so used to wearing. Perhaps I can find a red that looks best on me, and a white that doesn’t make me feel too stark. I plan to experiment, both with colors and combinations of colors, from various eras. April: Mend and clean clothing and improve skills. This is a first-class no brainer! My pile of mending and washing is ready to go, and almost everything in it is a vintage item I love. I keep up on the mending and cleaning for my business much better than I keep up with my own. I think it’s time to catch up, including figuring out how to take care of some things that I find tricky. May: Supplant my search for basic clothing with vintage basics. I don’t buy much new clothing, but find it occasionally imperative to go with new to keep myself in shoes and socks, for instance. I will spend May making a list of the basics I tend to need every year or so and then look for their equivalents in the world of vintage. I also will decide for myself what is a basic...we probably all have a different set of ideas. June: Wear scarves. Oh fun! I have scarves galore, almost all vintage from my own past and family members’ pasts. There is positively no excuse for how little I make use of these. I hope to learn new ways with scarves of all shapes and sizes. July: Look for style inspiration. I always am looking for style inspiration, but this July I will put extra focus on vintage style inspirations, whether from the past or being worn well by modern women. Expect to see too much of me on Pinterest! August: Find or decide upon the perfect go-to black dress. If ever there was a usable item, the perfect black dress might be it. I will look at this from various angles, including what I’d wear the dress for and what suits me best. You can be sure it will be vintage. September: Wear hats. I have some beautiful vintage hats and I tend to wear them for special occasions if at all. Everyone tells me they love hats, but just can’t bring themselves to wear them. Maybe they need someone to lead the parade? October: Wear an era that I don’t usually wear. I am big on 1940s and 50s and some 1960s and 70s styles. I really like the look of a sweet 1930s print, and the longer lengths of the time, but I’ve never worn 1930s clothing myself. November: Wear something meaningful to me every day. I have plenty of interesting family items, souvenirs from long-ago vacations, gifts from my favorite people and other items with great karma. I resolve to wear at least one of these each day in November. December: Find at least one vintage item to give for Christmas. I don’t take this lightly because I know that I can impose my taste on someone else if I don’t watch out. But deep down I know there is something vintage that would please and suit every man, woman and child. I just have to figure out what that is! Anyone care to play along? I’d love to know what your vintage resolutions are, and I‘d also love to have you join me with my resolutions during any of these months. I promise to share my results, if you promise to share yours!